Thanks, Marc. Hoping for more and more years of enjoyment at Jackie Robinson Stadium. UCLA Baseball: Another Victim of Title IX? Seems there is a rumor abound that UCLA will be dropping Men’s Baseball as yet another unfortunate byproduct of Title IX. I can not confirm nor deny these rumors, though I do have an email out to the SID and Director of Media, but if anybody has information PLEASE email me at evan.lovett @ gmail.com. 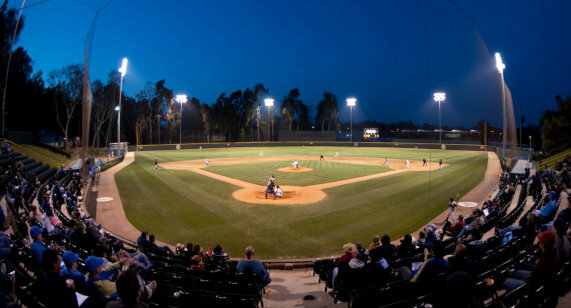 This is a shame not only because of UCLA’s extensive list of Major League Baseball players (Jackie Robinson, Eric Karros, Todd Zeile, Troy Glaus, Chase Utley – to name a handful), but the beauty and joy of Steele Field at Jackie Robinson Stadium. This move wouldn’t seem to jibe with the administration, who just upgraded the facility in attempt to make it more tournament-worthy, and aside from some early-season, bone-chilling wind in the VA-neighboring facility, there is not a more beautiful nook in the State to watch a baseball game. Stay posted, and please update me if you have any info.